Over many years, law enforcement officers have been using radio and headset to communicate in the field as non-stop communication is mandatory for any SWAT operation. Though they used to have a good radio system, the poor quality and bulky headset offer little protection for users. Information technology has changed over time so as ear-headsets. Technology brings stylish, lightweight, and quality earpiece instead of heavy and expensive ones. 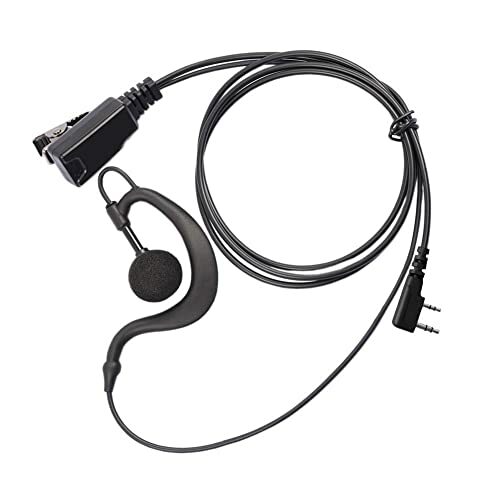 These radio earpiece offer increased comfort, custom-fit option, and low interference with the user movements. Though these new radio earpiece commonly used by secret service, FBI, and law enforcement agencies, but, the police department is their main consumer since they involve in the secret mission. They had to work together as a team so that they could communicate with their team member. If you are one of them and found yourself looking for the best police radio earpiece, we hope this article would give you a glimpse of all the features that could work for you. Read the rest to learn more. Security never relies on one individual instead of depends on a group of people that work as a team. In such case, radio earpiece allows the member to communicate across a long distance. For those devoted police officers, looking for the best police radio earpiece, we have made a list of ten best police radio earpiece considering customer concerns. Our collection includes all the models from trusted police gear manufacturer. Without wasting your precious time let’s start with the review. Our first earpiece in the list is Pulsat two-wire surveillance mic for use with many of the Motorola model radio. It earns our first place because of its heavy duty construction and durability. The PU cable of this earpiece made with Kevlar reinforcement that stands for about anything. This flexible PU cable ensures the maximum durability that you need for outdoor adventures. The soft and skin-friendly material provides comfort for long time wear. It produces excellent quality of audio whether you are transmitting and receiving the sound. A small lapel PTT microphone attaches with a metal clip for noise-free communication. The transparent silicon earpiece looks so light that seems hidden, so it doesn’t cause suspicion for the opposition. In spite of the rugged construction, the price is reasonable.It won’t be a waste of money at all. This model from HYS is specially designed for professionals who wear their microphone on their shoulder. It doesn’t cause overhearing because of the 3.5mm jack. This earphone set features two medium size silicon earpiece for both left and right ear. It is ideal for them who don’t want to bother others in the fairground. Especially useful for the officers while arresting a criminal without letting them hear the broadcasting. 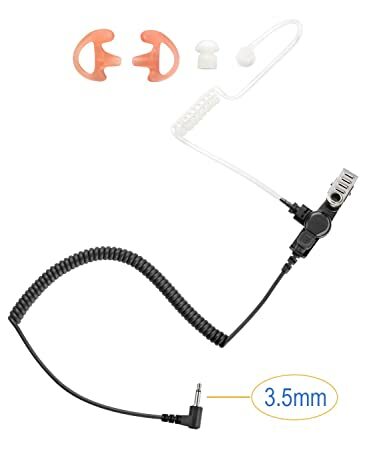 This listen-only earpiece features with a high-grade surgical tubing that is connected to a high output speaker. You can connect the speaker below the shirt collar. This design can be used with Motorola, Kenwood, Icom, Vertex, Ritron, and Maxon radio system. 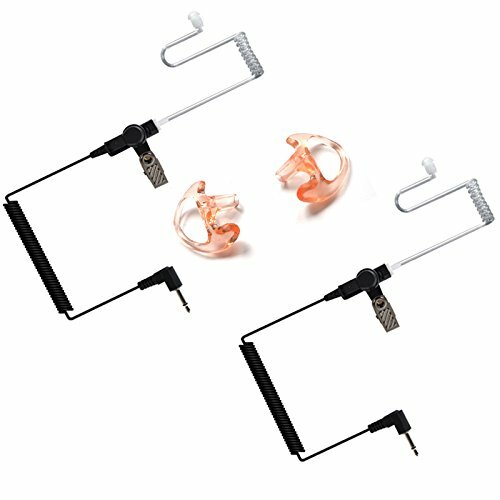 Two rubber ear-molds are flexible enough and easy insert option for ease of use. These ear-molds use for two-way radio acoustic tube type surveillance. Overall, this is the secure and comfortable way to listen to the audio privately. Also, you are getting this at a reasonable price. This G-shape ear hook makes the earpiece elegant along with the smart design. This Retevis earpiece is the best choice for your two-way radio. It will never let you down as the earpiece has the G ring ear hooks. This G-shape comfortable ear hook ensures that it stays in place without slipping. This stylish hook will never interrupt your communication. A mushroom-shaped rubber earpiece offers the ultimate listening experience. This earplug allows the arbitrary rotation if needed. With the ear hook, a 35cm PU cable connects a powerful microphone. A durable PTT button is attached with the microphone. In one side, it has a knob to adjust the volume of audio. So you do not have to change the volume through the walkie-talkie. You can clip the microphone at a suitable place with an attachment clip. That is why it is easy to operate without holding the radio. The microphone connects a jack through an 88cm PU cable. This PU cable provides long-term comfortable usage. This elegant design is suitable for use in the nightclub, bars, security, restaurant, airports, and so on. This compact and classy design is a bit pricey but worth with the features. This MaximalPower headset earpiece is strictly for the receiver or listen-only operation. This receive only earpiece is suitable for use with two-way radios, radio speaker mic, and radio mic. 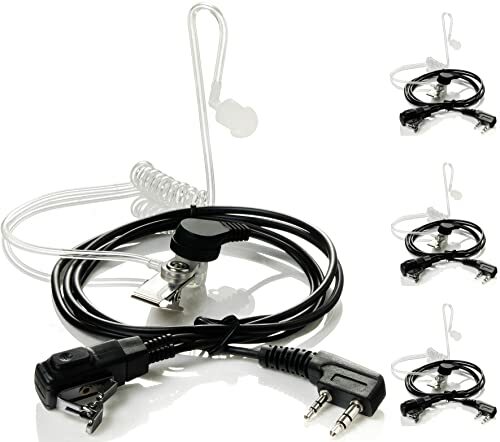 This surveillance headset has a clear coil tube earbud audio kits that fit any size. The coil option assures the flexibility. With the earbud, it has 3.5mm earpiece jack connector that connects with an output jack. The rugged and heavy-duty material ensure that it can stand with any situation for a long time. The reinforced clip provides the cable retention and removes strain on the earpiece. The earpiece is equally effective even in noisy environment. It provides discrete listening by minimizing interference. The earpiece is coated with polyurethane. You can also use the earpiece with MP3 player. It consumes a low power from the radio or player set. It means that the earpiece is suitable for both professional and recreational users. The price is also reasonable. G and check the store. Retevis walkie-talkie earpiece is an ideal choice for two-way radios but not for Motorola Talk about. The radio headset works fine with most of the famous brand. This versatile design is suitable for officers, businessman, and recreational user. This hands-free and acoustic tube earbuds fit nicely in the ear while keeping your conversation private. This soft earbud comes with an ergonomic design that blocks the outside noise. The earbud tube connects with a microphone set with one PTT button. This microphone picks the natural sound to ensure smooth transmission. A 360o stainless steel remote clip allows connecting the mic to anywhere close to the mouth. The transparent tube is connected with a transducer clip that keeps the communication private. You can quickly disconnect the clip if needed. The earpiece is suitable for low profile conversation. Cancellation of background noise is a bit poor than others. Keyblu is a well-known brand for manufacturing high-quality earpieces that fit two-way radios. 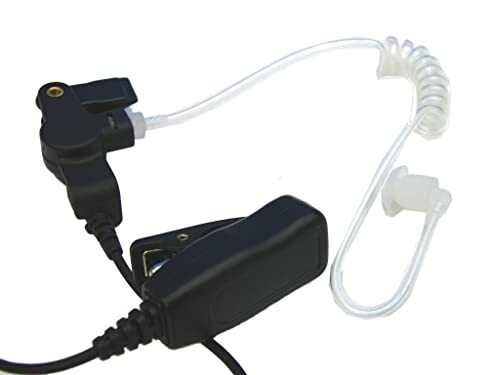 This multi-functional earpiece is excellent for both professionals and non-professional user. This is an ideal option for low budget consumes. Two soft silicon made earbuds give the earpiece an elegant look plus they fit nicely in your ear. This transparent acoustic tube connects a 3.5mm connector to the output jack. Besides the connector, a stainless steel clip is provided to attach with the shirt collar or anything. It comes with a long PU cable for ease of use. One end of heavy-duty PU cable is connected to the connector through two pins. The other end can be connected to radio speaker mic, MP3 player, and other audio accessories. That means it can be used for listening to music as well. The most exciting part of this earpiece is that it comes at a low price. The audio jack is a bit long for the mic position in the chest pocket. 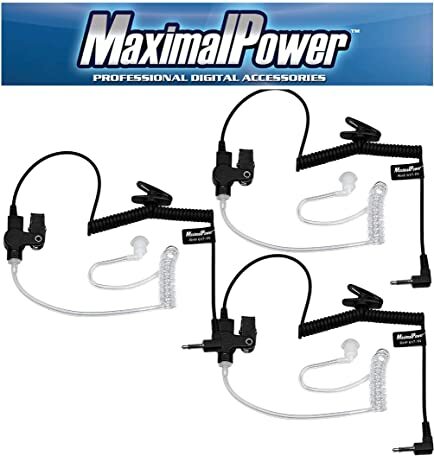 A universal clear-color earpiece by MaximalPower which is easily replaceable. It’s a great deal for the entire group and whole family. The critical feature of this earpiece is the compact outlook and lightweight design. Because of its clear-colored texture, mostly it is being used by the FBI and secret forces. They fit in your ear in such a way that no one is suspicious about it. This FBI style earpiece has an acoustic coil tube where one end of the tube has an ear tip. This ear tip is soft silicon mushroom shaped. It has a twist on the connector that works in Motorola, Kenwood, and others two-way radio. This connector end attaches a wire with the mic. The important feature of this earpiece is flexibility. The long flexible tube fits with anyone. The focus of this package is the low price for more quantity. So, there is no better deal than this. Check the store before stock out! Another G-shaped walkie-talkie earpiece brought to you by Arama. G-shaped hooks are always comfortable to wear. This sturdy earpiece is suitable to use for security guards, mountain riding, driving, military officers, and all others. This advanced G-shaped earpiece comes with an ergonomic design. 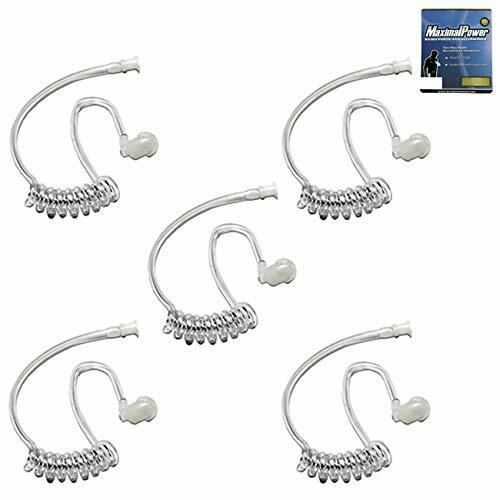 These ear hook fits in your ear so comfortably that you can use them for a long time. The earbud design is lightweight and compact that is adjustable on the left and right ear. 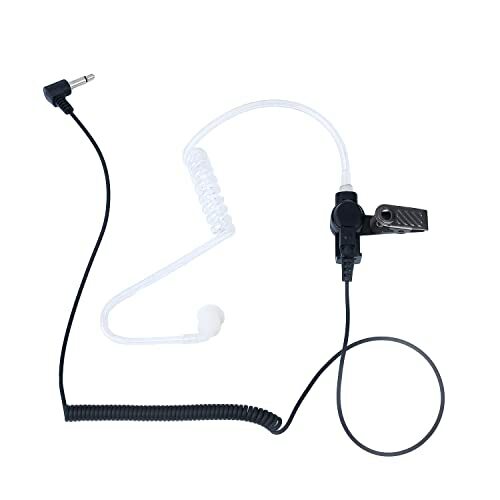 The compatible hook is attached with two pin earpiece headset through a PU cable. The headset connects with PTT and a powerful microphone. The PTT allows the user both listening and speaking. The loud microphone provides quality performance without any distortion. PU cable stands for durability and clear transmission from one end to other. The total length of the cable is about165 cm. Where the length from D ring to PTT is 65cm and from PTT to the connector is 100 cm. The earpiece has a two pin K collector that is compatible with any two-way radio. The cable won’t pull when it is plugged into the radio. So, it seems nice and tight. Moreover, the price is meager for this rugged construction. Among a massive collection of walkie-talkie earpiece, QOL TOP said they are the best. This earpiece might be an excellent deal for you. Well, let me tell you the reason. 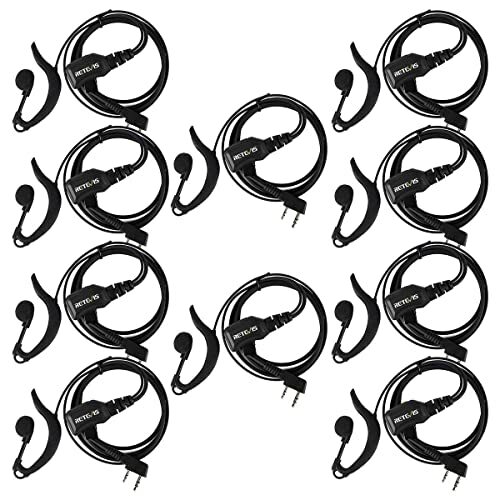 This earpiece set comes with a headset along with an excellent mic. This walkie-talkie by QOL TOP is equipped with a transparent acoustic tube that is reliable and comfortable. This two pins cool design is compatible with any device except Motorola, Midland, and ICOM. The soft plastic earbud fits in your ear without delivering fantastic sound quality as its flexible transparent outlook makes it less noticeable. The tube is then connected with a 360o rotation clip for reliable fastening. The clip is connected with a built-in microphone along with a PTT button. Another rotation clip for attaching the mic near the mouth. Then another end of PU cable is connected to your walkie-talkie device. This walkie-talkie earpiece offers a wide range of application. This gadget is not so heavy so you can wear them for a long time. The price is also reasonable like other in the list. The last earpiece in the list with a bright and elegant design by Communication. The design is entirely different than others in the list. Like, the PU cable used here is reinforced by Kevlar fiber and also it is twisted. Because of the twisted cable, it easy to handle the headset. Kevlar fiber ensures the high strength and durability of the earpiece. Besides, the PU cable connects with a high-performance speaker. A stainless steel clip is attached for attaching the mic near the shoulder. In one side a surgical grade UV resistant acoustic tube is connected through a 3.5 mm connector. This twisted acoustic tube has a quick connects or disconnects option. A soft earbud at the top of the tube assures the clear sound. The overall design is so simple that you can wear it in any situation. Also, two mushroom ear tip and one pair of ear mold are included with the earpiece. The installation of the tube is straightforward. Above all, the price is very reasonable for the classy design. We would suggest you try this one. As we said before, communication is essential and risky at a time if you are unable to find the best option. Any established police force is ineffective without proper co-ordination. Thankfully, you have looked for the solution. 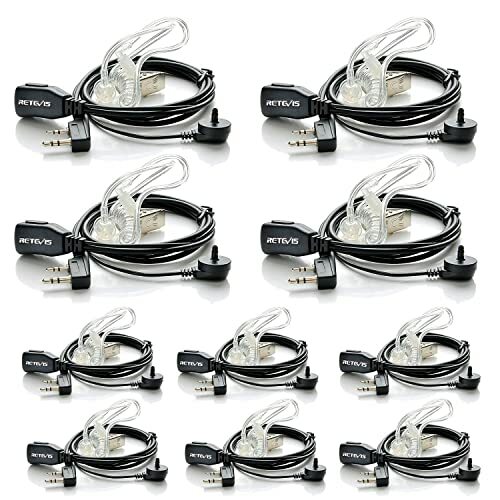 By far, the mentioned ten best police earpieces are affordable and fits in a variety of situation. We believe that all of them stands for compatibility also good enough for an extended period. Stay Happy and Stay Connected! The 10 Best Tactical Dog Vest in 2019 – Selected By Professionals Dogs became friends for human a long time ago.